Kotappakonda temple can be easily reached from Guntur (60 km), Chilakaluripet (21.5 km), Narasaraopet (19.1 km) and Vijayawada (98.9 km). Mangalagiri (The Auspicious Hill) is one of the famous temples of Lord Vishnu in India. The primary deity of Mangalagiri temple is Lord Narasimha Swamy (Incarnation of Lord Vishnu). There are three Lord Narasimha Swamy temples present in Mangalagiri. Panakala Lakshmi Narasimha Swamy temple is present on a dormant Volcanic hill. The main idol of Panakala Narasimha Swamy has a wide open mouth through which the priests pour the sacred Jaggery water called as Panakam. Devotee believe that this Jaggery water keeps the hill in a dormant stage and prevents Volcanic eruption. 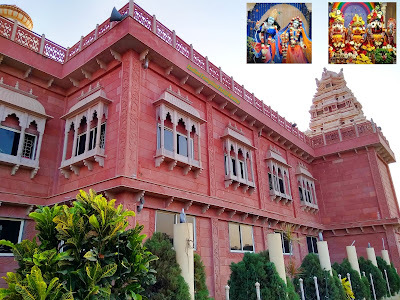 Mangalagiri temple can be easily reached from Vijayawada (15.1 km), Guntur(28.5 km) and other major cities of India. Amaralingeswara Temple present in Amaravathi village is dedicated to Lord Shiva as Amareswara Swamy is one of the famous Pancharama Kshetras in India. The 5 ancient Lord Shiva Pancharama temples are present in: Amararama (Amaravathi), Draksharama (Draksharamam), Somarama (in Bhimavaram), Ksheerarama (Palakol) and Kumararama (Samalkota). The consort of Lord Amareswara Swamy is Goddess Bala Chamundika. The Shiva Lingam at Amaravathi is very tall and the Pujari/Archaka need to climb a platform to perform the daily rituals and Abhishekam. Visitors can see a red stain on top of the Shiva Lingam even today, as a nail has been hit on top of the Shiva Lingam to stop its growth. Mahashivaratri is celebrated with great devotion at this temple. Amaravathi temple is located just 32.8 km from North-West of Guntur on the banks of sacred Krishna River. Amaravathi Temple is visited by many pilgrims throughout the year. Sri Bhavanarayana Swamy temple in Bapatla is an ancient temple built in the 5th century by a Chola king named Krimikantha. the temple was later renovated by Raja Venkatadri Nayudu or Sri Raja Vasireddy Venkatadri Naidu. The temple is dedicated to Lord Vishnu as Bhavanarayana Swamy. The temple is under the control of Archaeological Survey of India (ASI). The temple is at a distance of around 49 km from Guntur city. Annual Brahmotsavam, Chariot festival and all major Hindu festivals are celebrated with great religious zeal and enthusiasm at Bhavanarayana Swamy temple. The temple has a Dravidian style architecture. 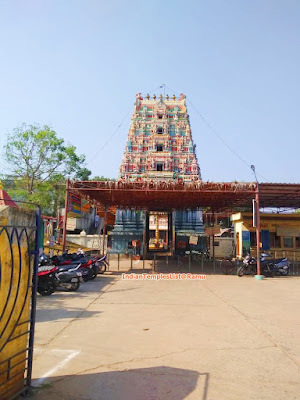 Sri Lakshmi Chennakesava Swamy Temple is a famous 13th century temple in Macherla dedicated to Lord Vishnu in the divine form of Chennakesava Swamy. This ancient temple is built here during the period of the Haihaya Kings. Palanati Brahma Naidu, who was the minister for the administration of Palnadu ruled by Haihaya King Nalagama, was responsible for the construction of this popular Chennakeshava Swami temple in Macherla town. The annual festival celebrated on a grand scale here in this temple. Macherla is just 23 km away from Nagarjuna Sagar. The famous Palnadu War took place at Karampudi between Macherla and Gurajala between 1176 AD – 1182 AD. Nearby tourist attraction is Ethipothala Waterfalls which is at a distance of around 8 km from Macherla. A trip to Guntur is incomplete without visiting the famous Vijayawada Kanaka Durga temple, which is just 35 km away from Guntur. ISKCON Guntur Temple located at Malla Reddy Nagar in Guntur has a peaceful and pleasant atmosphere. This great temple was started by the spiritual master HH Jayapataka Swami on 22nd March 2014. He is the founder acharya of ISKCON (International Society for Krishna Consciousness) and a disciple of HDG A. C. Bhaktivedanta Swami Srila Prabhupada. Address: Reddy College Road, Malla Reddy Nagar, NGO Colony, Guntur, Andhra Pradesh 522004. Guntur city is best known for Chilli export and has the largest Chilli Market Yard in (Asia). Mangalagiri is the abode of Lord Narshima Swamy on a dormant Volcanic hill. It is considered that the tradition of pouring Jaggery Juice (Panakam) has kept this Volcano in dormant stage. The Tobacco Board headquarters is present at (Guntur). The famous Palnati Yuddham took place in Guntur district at Karempudi on the banks of Naguleru River between 1178-1182 AD. Your opinion and thoughts on this post in the comments section will greatly help me to write better temple related travel posts in coming articles.